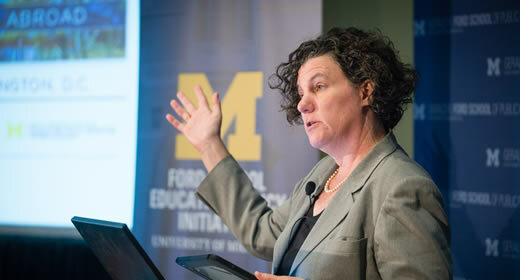 Earlier this week, the University of Michigan and Michigan State University announced a new partnership in which Michigan’s two premiere public universities will work alongside the state’s Department of Education to figure out what is and is not working in Michigan’s classrooms. The new Michigan Education Data Center, one of two projects at the center of this partnership, will operate out of the Ford School. The data center will help develop research detrimental for the success of Michigan’s schools, similar to the research on the universal application of the SAT at the state’s expense. Such research permitted “far more low-income students…[to take] the test” consequently opening the opportunities for these students as they “were scoring quite high” Professor Dynarski points out. The Michigan Education Data Center aims to continue to produce innovative research for the benefit of all students in Michigan schools. To read more about the partnership, click here, View the story "UM teams up with MSU, state to launch reserach and data center" from MLive here. Susan Dyarski is a professor of economics, education, and public policy. Professor Dynarski serves as the co-director of the Education Policy Initiative, a non-resident senior fellow at the Brookings Institute and is the president for the Association of Education Finance and Policy. Professor Dynarski also holds a position on the American Economic Journal/Economic Policy Board of Editors.